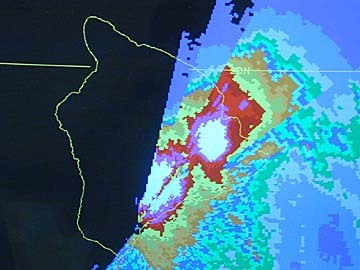 feet of rain fell in East Hawaii. Click for larger view. HILO -- Record amounts of rain paralyzed much of Hilo and East Hawaii this morning, closing major roads and flooding homes. The National Weather Service said 26.22 inches fell at Hilo airport in the 24-hour period after 7 a.m. yesterday. The previous was 22.3 inches on Feb. 19-20 in 1979.
at least 10 inches of rain. Flash flood warning in effect this morning. More than 27 inches of rain have fallen since 7 a.m. yesterday. 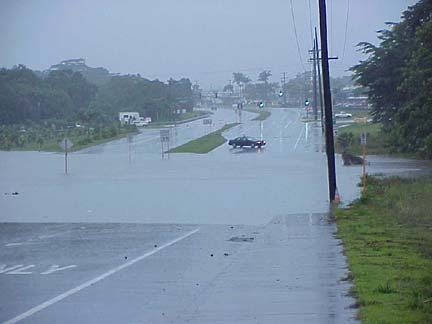 Highway 19 flooded in several places between Laupahoehoe and Hilo. Homes flooded and evacuation centers opened. East Hawaii public schools closed. State and County offices closed. Flash flood warning in effect for Maui, Lanai and Molokai this morning. Hana Highway closed in several places. Flash flood watch in effect this morning. When a flash flood warning is issued, flooding is imminent or already occurring. A flash flood watch means flooding is possible. The weather service said the storm was moving slowly to the northwest and had begun to affect Maui this morning. Oahu and Kauai may see heavy rain this afternoon or tonight. By this morning, many homes in East Hawaii had been flooded, and families were flocking to emergency shelters. Carrie Vicente, who lives in Awapuhi Street in Hilo, said she and her family were rescued by neighborhood boys on body boards who took them one by one across deep floodwaters. Vicente said she, her two children, her elderly grandmother and her roommate were trapped in their house, "and we don't know how to swim." Highway today, near the Blow Hole. "They (the Flores boys) took each of us to safety, then went back to get the grandmother who lives in the back house," she said. In Mountain View, Audrey Villanueva and her five children battled to keep water from entering their house. Although the house is raised on stilts, the knee-deep water was just below the floor. In some parts of her yard, Villanueva reported the water was chest deep. Villanueva said her driveway buckled and washed away, along with her doghouse. Others who found parts of their homes flooded last night called on Civil Defense to supply sandbags to keep the water out. In the end, there were so many calls that the agency had to give up and respond only to life-threatening situations, said Civil Defense Deputy Bruce Butts. People stranded in stalled cars and others caught by rising water at their homes had to be rescued by county workers, he said. Most East Hawaii residents were unable to go to work or school today as major roads turned into rivers. Public schools in East Hawaii were closed, as were state and county offices. Prince Kuhio Plaza in Hilo. Scattered power failures were reported but the Hilo airport remained open. Hawaii Electric Light Co. said one of its larger power producers had been struck by lightning and would not be back in operation until this afternoon. The power company was also having problems with its own generators. On Maui, several sections of Hana Highway in East Maui were closed, including the seven pools at Ohe'o in Kipahulu, mile post 50 in Hamoa, and Ulaino and Waikaloa roads leading into Hana town. All public schools in Maui County were closed. 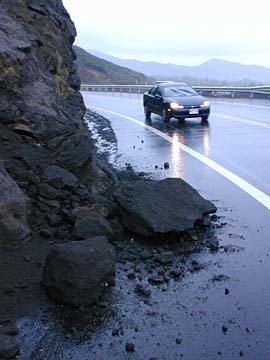 A rockslide was reported at Kalanianaole Highway near the Blow Hole on Oahu, but it did not affect traffic. About 26 people took shelter overnight at Hawaii County's Seven Seas Luau House meeting hall, said Verna Dias, disaster chairwoman for the shelter. Another evacuation center was opened at Shipman Gymnasium in Keaau, south of Hilo. Numerous others called Civil Defense to say they were leaving their homes to stay with family or friends on higher ground. Hilo police said this morning that they had officers living in the lower Puna district who were unable to come to work because of road closures. 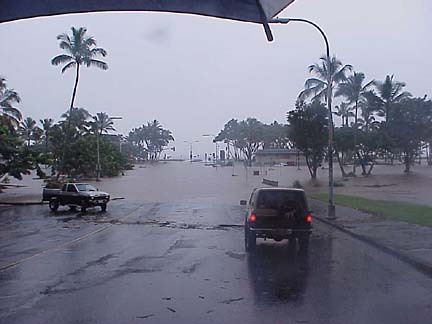 Several of Hilo's main traffic arteries were closed by the flooding, including the bayfront Kamehameha Avenue. of rain fell in East Hawaii today. 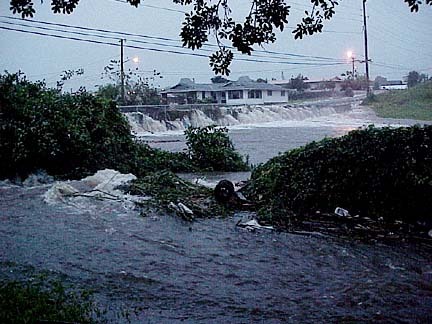 The Alenaio Stream flood control channel in the area was working as designed, carrying huge quantities of water from upland areas and dumping it into a grassy soccer field where it overflowed onto Kamehameha Avenue. Kilauea Avenue through downtown Hilo remained open. But farther inland, an overflowing culvert forced the closure of Komohana Street above downtown. Kaumana Drive, a vital artery normally carrying traffic downhill from an upland wing of the city, was blocked at Ainako Avenue. 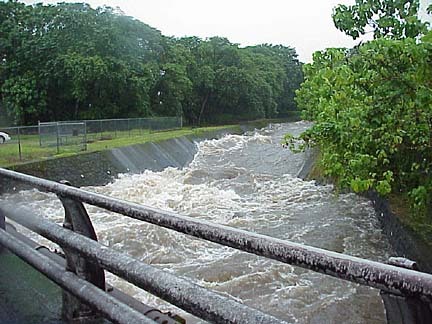 In the other upland wing of the city, the Waiakea area, an overflowing stream closed Kawailani Street. Pauahi St looking east to Kamehameha Ave. and the bayfront. Flooding closed the Keaau-Pahoa road, Butts said. In Kona, Alii Drive was closed. And several miles of the Hawaii Belt Road were closed in the Kau district due to heavy runoff across the highway at a normally dry ford area near Pahala. The Belt Highway was closed at the entrance to Hawaii Volcanoes National Park on the Hilo side and near Pahala on the Kau side, he said. Hawaii Volcanoes National Park remained open today, but the road was open only from the visitors center to Jaggar Museum. The rain forced two visitors from South Africa to spend the night in the men's restroom at the Namakanipaio campground. "The water was knee deep. We didn't even get to set up our tent," said Clyde Pellew, 25.
water at the bridge near Puainako Street. The park service picked them up and brought them to the visitors center. The park service said it believes there are a half-dozen back-country hikers down Mauna Loa, Red Hill and on the summit, but thinks the hikers are probably in the cabins. Heavy rain was expected to continue on the Big Island today but could ease somewhat this afternoon, said National Weather Service lead forecaster Bob Farrell. Weather Service forecasters in Hilo could not get into their office this morning because of flooding, Farrell said, and so much rain fell on the Big Island that the weather service had trouble measuring it using their rain gauges. "They're automated, reporting by phones, which aren't working too well," Farrell said. "Imagine your PC sitting in two feet of water and you see what I mean." 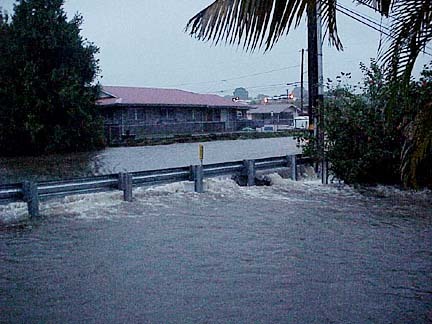 Most of the Kau, Hilo and Puna districts had more than 15 inches of rain, and 10 inches or more soaked Pupukea and the area from north of Hilo to South Point. "They needed the rain, but I don't think they needed it all at once," he added. Gary Kubota also contributed to this story.